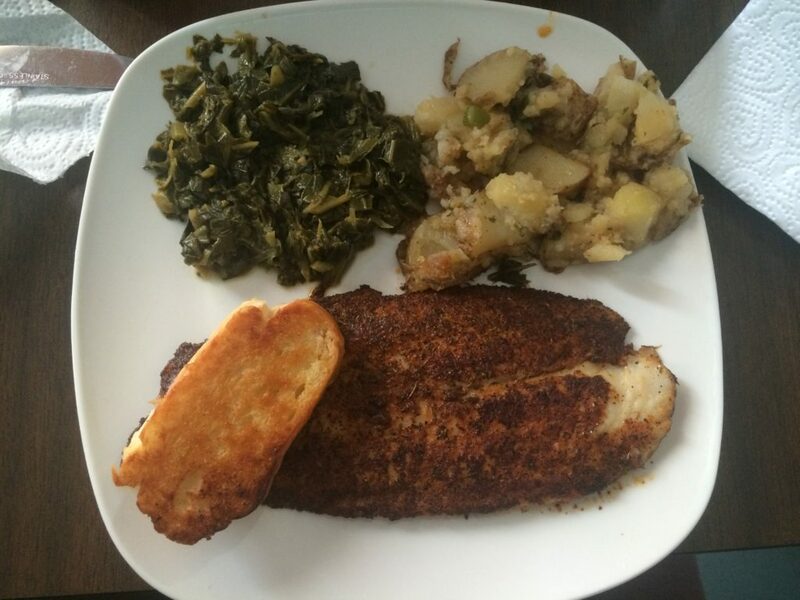 Ok, so Rays On The Ave is my favorite spot to eat out right now, for the reasons I outlined in the last blog entry – it’s delicious, good portions, affordable, and black-owned in an area that is being quickly gentrified. If these are my criteria for the perfect place to eat in New Orleans, then I’ve found another slice of perfection. Today some friends and I went to Kayla’s, on St Claude, and had our minds blown! St. Claude is the corridor of gentrification in the ninth ward. These days, a new business opening up on St Claude is almost definitely a shrine to yuppie garbage. The Grey Store is a block away from Kayla’s and just closed down. It used to be a great spot to get a cheap “spaghetti square” but is being remodeled and will probably be something terrible. Even closer to Kayla’s is one of the dumbest places on St Claude – Red’s Chinese! Nothing like a pretentious and expensive “fusion” Chinese food restaurant owned by a guy who has been really creepy to some of his female employees. Would you like a side order of guilt with your $16 General Tsos Chicken? I recommend going to Red’s Chinese website and looking at how gross and racist it is, if you want to feel even worse about local bourgeois restaurants. When I saw Kayla’s opened I wrongly assumed it was going to be following that trend. But my friend gave me a tip that it was worth checking out, and I am so glad they did. It’s super cute inside: they had local politics on the TV, were playing some nice old school RnB, and margaritas/martinis were only $3! Trump became the president the night before, so we all really needed a few strong drinks and a good meal to get us through this surreal nightmare. The owners were there cooking and serving the food and seemed like real sweet people. 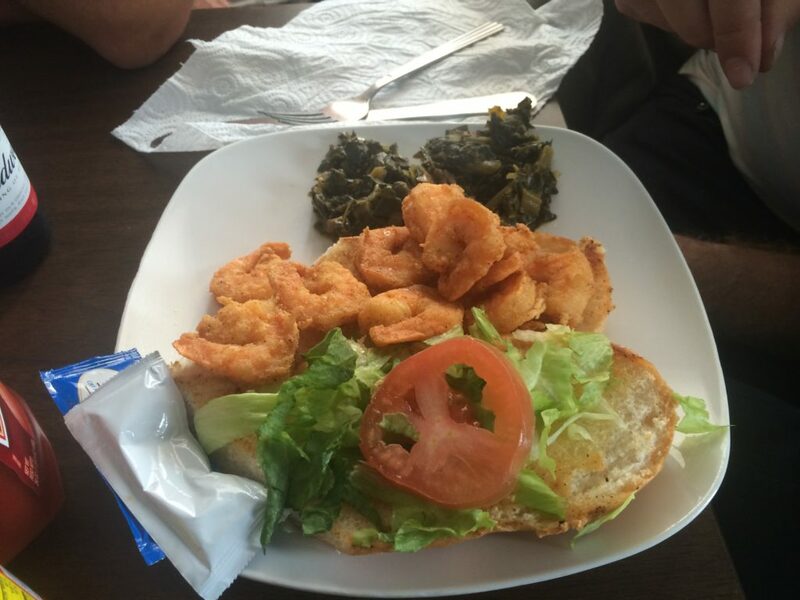 We got the blackened catfish, a fried shrimp poboy, and a porkchop, all with some great sides. The porkchop was breaded and panfried. It was so tender that at first I was afraid it was undercooked, but actually it was the best porkchop I’ve had in years and was cooked to perfection. I got jambalaya and collared greens and they were both heavenly. The jambalaya was as good as my family makes it, and the collards weren’t too soggy or greasy like a lot of places collared greens. The po-boy was 6 inches so it wasn’t huge but what it didn’t have in size it made up for in flavor. The fried shrimp po-boy was really good, comparable to the Orange Store (which is the gold standard of shrimp po-boys in my opinion) but in a really different way. It had a really thin fried coating instead of the thick breadcrumb style of the Orange Store, but I still think its one of the best shrimp poboys in town. The blackened catfish rocked me. It was so flakey! It was just one fillet but came with two sides and a piece of bread so it was a good amount of food. I only got a few bites because my friend ordered it, but I need to go back soon and eat it again. My friends got it with a side of creole potatoes that they said was good, but I didn’t try it because I was too obsessed with my pork chop and jambalaya. I’m probably going to go to Rays more than Kayla’s, but only because its much closer to where I live. 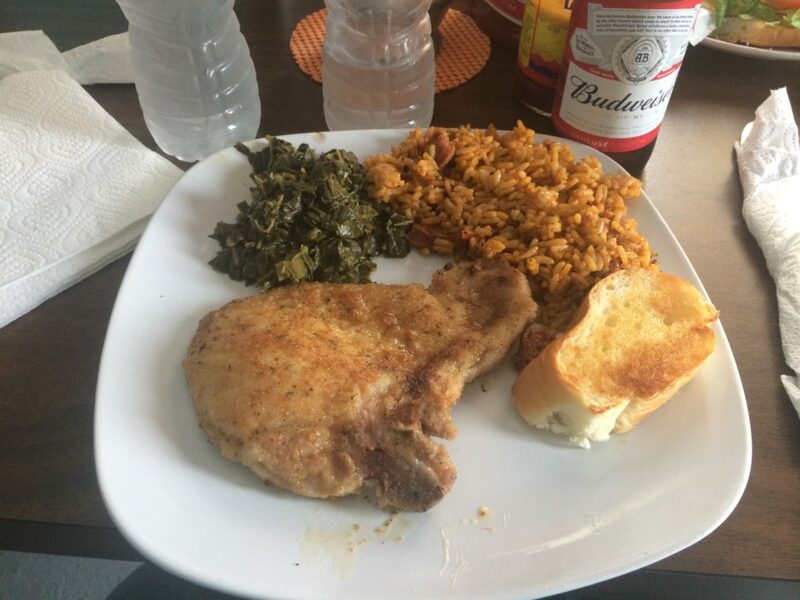 If I lived in the 9th ward you could find me at Kayla’s all the dang time! We only paid $7 for each entree and $5.99 for the po-boy, but I think it gets more expensive after 2pm. I’m still going to hustle my bustle up to Kayla’s on a semi-regular basis, to support an ethical Saint Claude business and get good food for cheap. I’ll see you there!